More than 15 years ago, my phone rang. On the other end was a software company with a new project—a case study on one of its satisfied customers. Admittedly, as a corporate freelance writer, I’d never heard of case studies—let alone knew how to approach one. I searched the web, looked in bookstores, and asked around. Yet I couldn’t find any information on the “whys” or “hows” of customer case studies. I forged ahead on that project anyway, learning as I went, and in the process discovered a love for storytelling. Over the past 15 years, that one project has led to hundreds more for dozens of companies. Most significantly, I’ve learned—literally—a book’s-worth of knowledge about creating, managing and using customer stories. I set to work putting down all my battle-tested experience with customer stories. PLUS, I interviewed dozens of companies and industry experts about their best practices and insight on case studies and success stories. 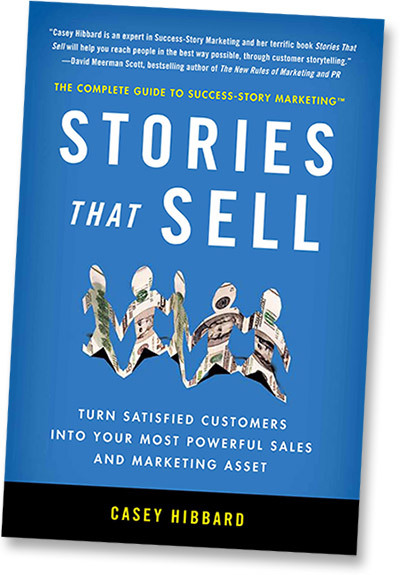 The Marketer’s Toolkit – PDF companion to Stories That Sell with resources to help marketers, business owners, and others managing customer stories. The Writer’s Toolkit – PDF companion to Stories That Sell with a wealth of resources to help case study writers. Want to save a little?